1 Combine Knorr® Homestyle Stock - Reduced Sodium Chicken with 1 tablespoon lemon juice, 2/3 of the garlic, 1 tablespoon oregano and 1/2 cup yogurt in small bowl. 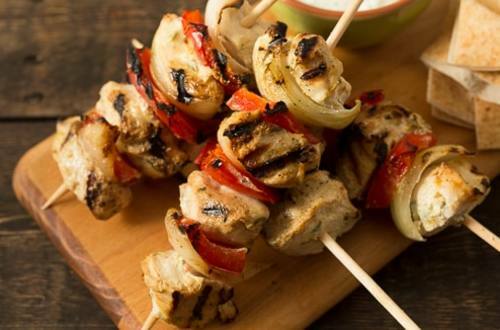 2 Alternately skewer* chicken, pepper and onion on skewers. Arrange skewers in glass baking dish, then drizzle with yogurt mixture; turn to coat. Cover and marinate in refrigerator 30 minutes. 3 Meanwhile, combine remaining ingredients in small bowl. Refrigerate until ready to use. 4 Grill or broil chicken and vegetables, turning once, until chicken is thoroughly cooked and vegetables are tender, about 6 minutes. Serve with yogurt dipping sauce.